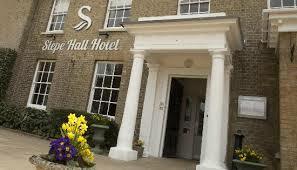 There are many places to dine within Slepe Hall, St Ives, catering for all tastes on any occasion. We can cater for parties of up to 250 people within the Brunel Suite and have several options available for smaller groups to dine in luxury. Slepe Hall, St Ives offers our superb menu within the hotel restaurant, produced from the finest ingredients, in relaxed, comfortable surroundings overlooking our garden. The restaurant serves breakfast, lunch and dinner all week long. The newly refurbished hotel bar provides a contemporary setting to relax and enjoy a wide selection of drinks, snacks and delicious home cooked food. We also offer wines and champagnes by the glass and a large selection of wines from around the world in our extensively stocked cellar. Ramsey’s Brasserie is located within Slepe Hall, where you can enjoy our superb menu produced from the finest ingredients, in relaxed, comfortable surroundings overlooking our garden. A selection of daily specials is also available. Ramsey’s Brasserie source only the finest local ingredients and stock a large selection of fine wines and champagnes.